So Chelsea Clinton is thinking about running for office according to a Vogue magazine exclusive. I predicted this last year and I’m glad to have been proven right. Take that as a yes, she’s running. It is the obvious step for her, the daughter of two of the most famous politicians in American history. The apple did not fall far from the tree and now at 32, bright smart, committed to causes she is as good as throwing her hat in the ring. Before that she will seek a run for Congress in 2014 is my best bet. With parents like her how could she not get bitten by the political bug? What is more she would be very good at it. I have met Chelsea a few times and can confirm what most people say -- this is a classy young lady, raised the right way by her parents. So often kids of famous parents get crazy in order to get attention for themselves. 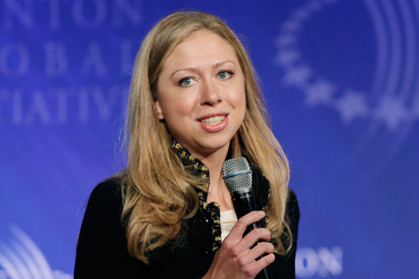 Not Chelsea Clinton who has been a straight arrow through her college career in Stanford and since then as a working girl. But she has to carry that gene, that one that John Kennedy Junior and Caroline had. Caroline made an abortive run for New York senator, John John was thinking about running in New Jersey. Chelsea they say will run upstate for a congressional seat to begin with. She will win in a heartbeat-- imagine Bill and Hill campaigning for her! And then it is on to who knows what. She is a very smart girl as I leaned when she discussed her master’s thesis on the Irish peace process with me. She has the moxie, looks and connections to go very far.